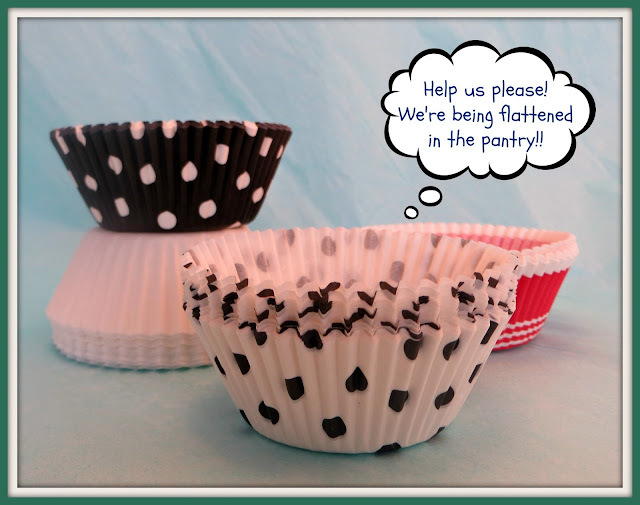 Cupcakes have become quite the rage over the past few years and we've seen a huge increase in the variety of liners out there. I used to just store the leftover liners in a Ziploc bag in the pantry but they kept getting squished!!! Since we've started blogging, well, ok, actually since I discovered Pinterest, I'm loathe to throw anything out! 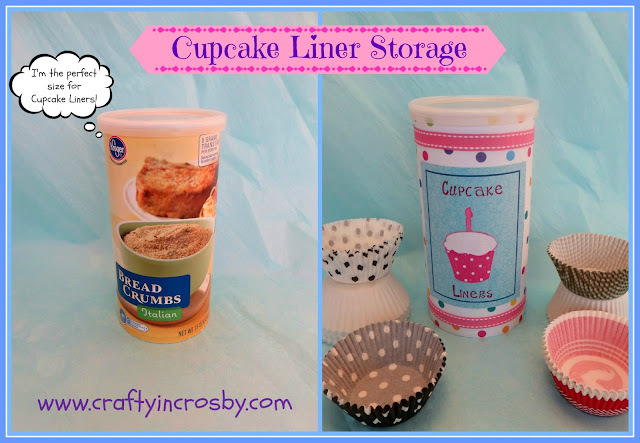 When I emptied up a bread crumb container, it struck me that it would make the perfect Cupcake Liner storage!!! So I gathered up all the liners that I could find, salvaged those that weren't squished and promptly stuck them in the empty container. Worked like a charm and I thought I would make it pretty and blog about it. Fast forward 6 months and I finally made it pretty! Better late than never is my motto! What do you think? I covered the container with a white sheet of cardstock, then covered it in the polka dot paper (so the print wouldn't show through). Cut out the cupcake shape with my Cricut and attached it to rectangle of paper that I printed out the words on. I think I'll probably cover it in clear vinyl too (maybe in another 6 months! ), because I am not the tidiest baker around and I'd hate for it to end up all covered in frosting and cupcake batter! Dollar Tree had Progresso bread crumbs on my last visit, so I'll soon be making another one. I mean really, is there anyone out there that wouldn't love to have a few of these in their pantry? You could even make them themed - colors or holidays - that is, if you love bread crumbs! I might even be tempted to buy some more bread crumbs and dump them in a Ziploc bag!!! Hope everyone had a fantastic weekend! I can't believe it's almost over with!!! Wonderful idea! 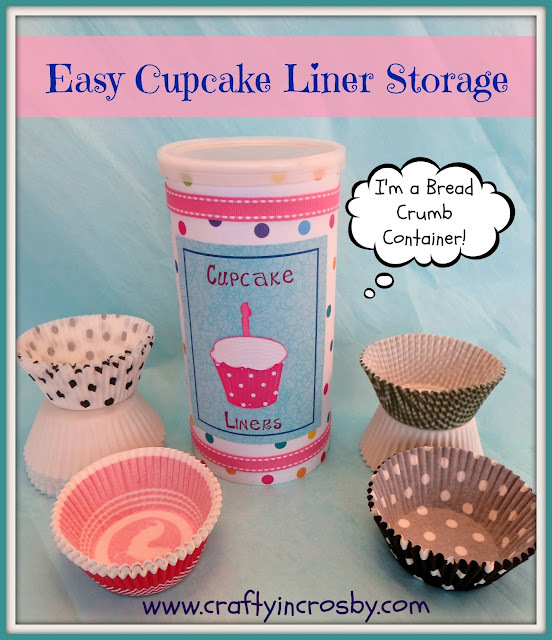 There are so many cute cupcake liners - our collection has grown, too. I will have to do something like this to keep them looking nice. Thank you for sharing your idea! Thanks Laurie - I really love how easy it was and I love that my cupcake liners aren't being crushed anymore! Thanks for dropping by! Frugal and cute! Plush it helps keep them from being squished! Thanks for stopping by today! We love our guests! What a super-duper cute and efficient way to solve the old smashed cupcake liner. I'm really loving this idea, not only because it's adorable, but also because it's "green"! I enjoy re-using things and doing my part to save the earth. Thanks for sharing. Pinterest has inspired me to keep containers of every type. There's almost always something you can make with them. Green also means Cheap - well at least in this case - and I am super cheap! LOL! I am so doing this - I was organizing my pantry the other day and was trying to figure out what to do with all of my cupcake liners!! Sandy - I hope you like yours as much as I love mine. I can't wait to use up my remaining bread crumbs so I can make another! Thanks for stopping by and visiting! Come Back Soon! Newest follower from Covered In Your Grace Monday Meet Up! I am loving your idea of the cup cake holders. Thanks Joanne! I'm following you now too with Bloglovin! Thanks for dropping in today! Thanks D! I'm following you now via Bloglovin and Facebook! My family always makes fun that I save every container, but look how many things they are good for. This one is great, thanks for sharing. This is such a great idea! I have my cupcake liners all over - I could really use something like this! That is a brilliant idea! 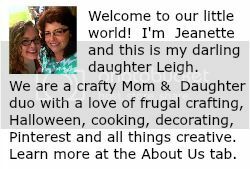 I would love for you to link up at SHOW-licious Craft Showcase! Thanks for linking up with the Meet & Greet Blog Hop! Mine are ALL OVER my baking drawer...all crinkled and stuff. This is awesome. Totally need to do this. Thank you for sharing at our Pinteresting Party! What a great idea!! We have so many for crafting that I have a huge bin of them. Here from the blog hop! Great idea! Mine always end up all over my cabinet. Visiting from the blog hop! This is such a CUTE and CLEVER idea! Thanks! Hi Ladies!! This is a very "Pinteresting" idea! Love it! That's an awesome idea! Thanks for sharing at Pinworthy Projects. We Fixed our Ice Maker!! !